But it's true. There are more people recreating today than there were a few years ago. Indeed, a report in the Outdoor Foundation estimates that 1.6 percent of the American population participates in climbing either indoors or out. That's a whopping five million people! Yasso took this picture on the third pitch of Purblind Pillar on the Angel Food Wall. This image predicated a long thread on MountainProject.com. 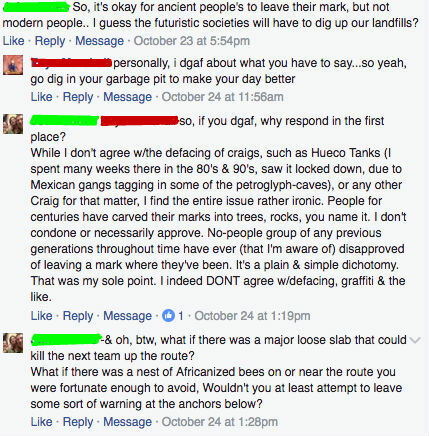 The green poster understands the problems with graffiti, but points out that there's some hypocrisy when it comes to modern vs. historic graffiti. This isn't a terribly uncommon perspective. 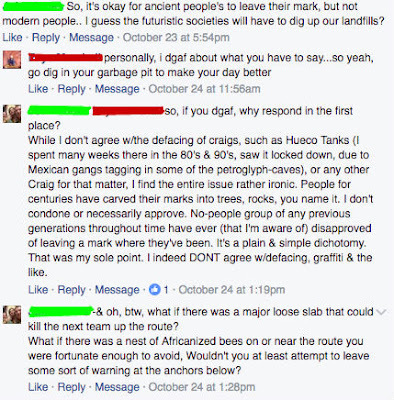 The thinking is that if ancient peoples did it, then why can't I...? The protection of Native artificats is clearly definied in the 1906 Antiquities Act. 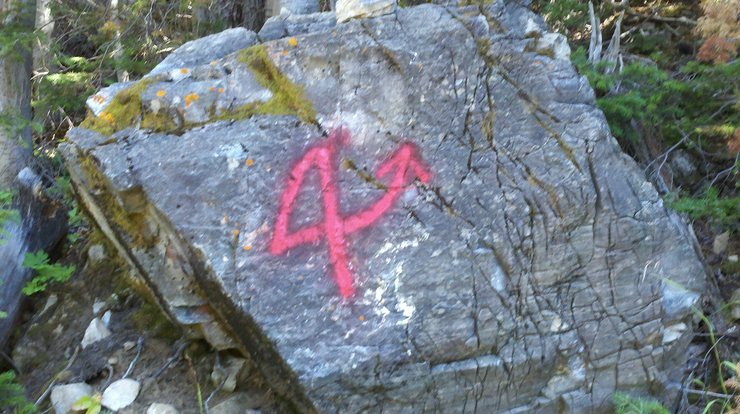 This law was designed specifically to protect ancient Native American ruins. There was significant fear that people were destroying ancient artifacts by both taking them and by changing them -- often by making marks on them. The Act was further defined by the 1979 Archaeological Resources Protection Act. These laws make it illegal to deface Native petroglyphs and pictographs. And further, they make it illegal to disturb or take Native artifacts off public lands. These acts do not protect modern rock defacement. Indeed, recently an artist was found guilty of painting pictures on rocks in National Parks thoroughout the west. 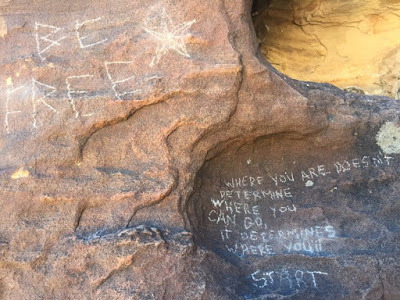 Casey Nocket of San Diego, traveled across the west painting pictures on rocks in protected areas. In June of 2016, Nocket pled guilty to seven misdemeanor counts for this defacement and was ordered to complete 200 hours of public service. It's not clear if she had to clean graffiti off rocks. It's not terribly uncommon to find notes scratched into multi-pitch lines. I've found notes like, "No Bolts!" and "No!" scratched into terrain to notify a climber that there were missing bolts on a route or that they were going the wrong way. This type of message belongs on a local climbing forum, like mountainproject.com, supertopo.com or cascadeclimbers.com. It doesn't belong on the rock. public lands can easily lead to climbing closures. The world renowned mountain guide, Randall Grandstaff, died in a rappelling accident on the Great Red Book in Las Vegas on June 2, 2002. Shortly after his death, a dedication reading "Our Bro R.G." was scratched into the rock on the route. About two weeks after the dedication was scratched in, someone else tried to scratch it out.